The grant will support MESO's current work in Portland and new work in Gresham, specifically in the Rockwood Rising Market Hall. KeyBank's investment will allow MESO to offer comprehensive business development and small business technical assistance services to over 150 clients in each of the two grant years, with a focus on the area’s growing minority and women-owned business sectors. “Our mission is to help our communities thrive, and nowhere is that more important than in underserved communities that often lack access to business expertise and funding,” said Michelle Weisenbach, president of KeyBank in Oregon and SW Washington. “We are delighted to partner with MESO to help these industrious small-scale entrepreneurs improve their communities through business development, as we have seen that MESO’s proven model and comprehensive services lead to increased revenue, business retention and loan repayment.” Weisenbach added that they were impressed by MESO’s success rate, where 92 percent of clients remain in business after graduating from MESO's programs and loan repayment is 99 percent. MESO services supported by the grant include individualized business education, planning, goal setting, accounting/tax assistance, market research, mentoring/peer support, access to financing and savings programs and referrals to community resources. 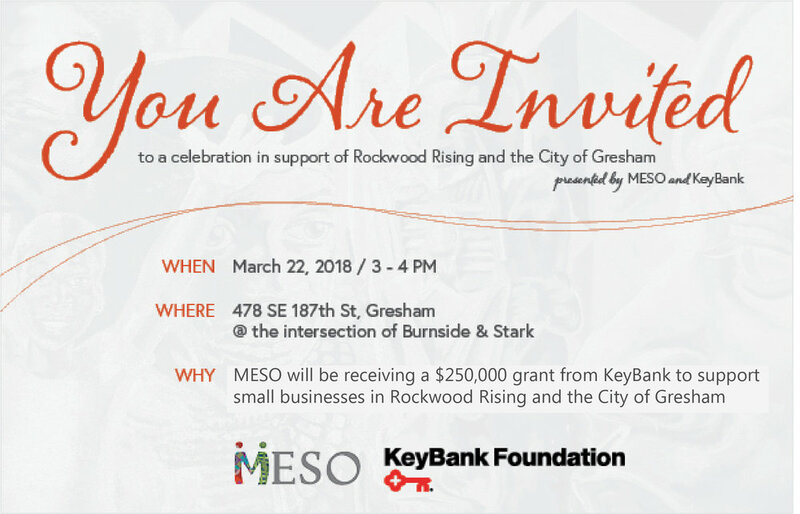 In Rockwood, MESO will play a key role in the City’s largest urban renewal project in Gresham’s history—Rockwood Rising. Scheduled to break ground late this spring, the development will include a Market Hall featuring space for micro-entrepreneurs, food vendors, pop up shops and more established businesses. MESO’s technical assistance to potential Market Hall tenants will help them bring their business dreams to life. Since summer of 2017, MESO has assisted 65 diverse entrepreneurs in the City of Gresham with business planning, building credit and understanding financial statements. KeyCorp's roots trace back 190 years to Albany, New York. Headquartered in Cleveland, Ohio, Key is one of the nation's largest bank-based financial services companies, with assets of approximately $136.7 billion at September 30, 2017. Key provides deposit, lending, cash management, insurance, and investment services to individuals and businesses in 15 states under the name KeyBank National Association through a network of more than 1,200 branches and more than 1,500 ATMs. Key also provides a broad range of sophisticated corporate and investment banking products, such as merger and acquisition advice, public and private debt and equity, syndications and derivatives to middle market companies in selected industries throughout the United States under the KeyBanc Capital Markets trade name. For more information, visit https://www.key.com/. KeyBank is Member FDIC. Launched in 2005, MESO’s mission is to improve the economic opportunities of underserved individuals through empowerment, education and entrepreneurship for the benefit of the greater community. MESO offers comprehensive business services in Oregon, and SW Washington, that include innovative lending and savings programs, technical assistance, business education and planning, and marketing and accounting support to underserved communities. MESO is a designated SBA micro lender and SBA PRIME recipient, an IDA fiduciary, a USDA RMAP (Rural Micro-Entrepreneur Assistance Program) lender, and a Community Development Financial Institution (CDFI). MESO fills a much-needed niche, working with small businesses through conception to growth and from asset building and credit preparedness to first loans and business launches, to business expansions every year. Rockwood Rising is proud to partner with MESO, who are now offering free business services to Rockwood residents at the Rockwood Community Office, 478 SE 187th Ave Portland, OR 97233, Tuesdays and Wednesdays from 10am-6pm. For more information, contact cmadrid@mesopdx.org or rockwoodrising@greshamoregon.gov.